This event had taken myself, David and his wife Janet several months to prepare! In fact, we should have had two meetings but once we had arrived in Moldova we found out that the second meeting in Chisinau unfortunately could not take place. So, on 12 April 2014, in ‘Metanoia’ Mission House I had the privilege of hosting English language teachers who had come from different parts of Moldova to improve their qualifications. These teachers are our brothers and sisters who use their teaching as a form of evangelism. In many places they successfully combine teaching children, young people and adults with sharing the Good News of God’s Kingdom. 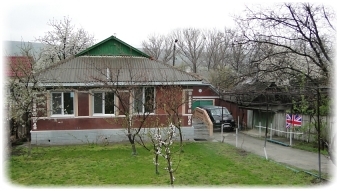 For example, in Cahul, in the South of Moldova, there is a school with over 100 students! Not all the schools are so big but all of them offer more than just learning a foreign language. Each person who enrols on one of these language courses has the opportunity to hear the Gospel and enter into a relationship with Jesus! The main speaker at the conference was Sally, an English lady, who apart from training up teachers also runs an amazing ministry called ‘GoMissions’. She travelled to Moldova together with Alisa, an American lady, who also works in missions. Both Sally and Alisa live in Italy. We met for the first time at Chisinau airport. Previous contact with them had been through David and Janet Adams. During the conference I was also able to briefly present the work of MPD in Moldova and share testimonies of God’s work concerning the running of our Mission House. David and Janet also spoke at the conference. For several years they have been supporting Christian language schools by sending books, CDs and DVDs for learning English to over 20 countries all round the world! 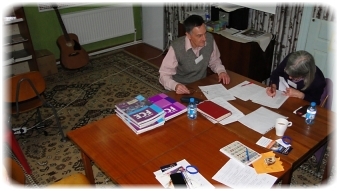 It all began with an email I received in 2009 offering me 5 tons of EFL books for Moldova. This task was too great for me and the only thought I had was to pass the information on to an English couple from our church, David and Janet. And so this mission was born and is still developing dynamically! A second part of this book sending mission includes the organising of our conference in ‘Metanoia’ Mission House in Straseni. On each of my trips to Moldova I have the privilege of transporting materials for teaching English which have been prepared by David and Janet. I am so happy that our mission base in Moldova also serves as a place of training and support for language teaching mission work! I had never thought about this before but, as we can see, God’s plans are much higher than ours and are way above anything we can imagine, plan, foresee or even dream of! Glory to Him! With slight fear and trembling we await further ideas from the Lord! Unfortunately, on this trip, I didn’t have time for any of the other mission projects we are involved in. Apart from the conference itself in Straseni, we also visited a language school in Cahul; we travelled to Transnistria, to Tiraspol to see the work there. The trip in itself to the self-proclaimed Moldovan republic was a challenge in itself … We also visited Svietłana, the director of the ‘Liora’ Mission In Chisinau. On Sunday we went to the church service in Bukovca. 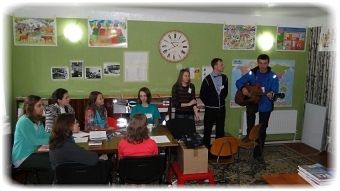 During this service the idea of running a language course in the village was born. Finally, a few statistics to help you better understand this whole undertaking. In less than two weeks we covered over 3300 km; we travelled through 7 countries (Poland, Slovakia, Hungary, Romania, Moldova, Transnistria, the Ukraine); we used 7 different currencies (Polish zloty, euro, Hungarian forints, Romanian and Moldovan leu, Ukrainian hryvnia and Transnistrian rubles); we spoke in four different languages (Polish, English, Romanian, Russian). To cut it short, it wasn’t easy …. BUT hey! We all returned safely home to the countries we had left. We experienced God’s blessing and joy coming from our fellowship with our sisters and brothers. That’s not by chance! That is the effect of corporate prayer! Thank you to everyone who was involved and helped through prayer and other ways! We are so grateful to God that not alone, but TOGETHER with you, we can serve in Moldova! To Him be the glory!